We are gearing up to go on our 2nd ever plane ride. So I have been trying to brainstorm some stuff to take on the plane with us to keep the girls busy. Yesterday, on a trip to Target, I saw these little tins in the dollar section that I thought could be useful for the plane trip, although I wasn't sure exactly what I was going to do with them. The tins had a a little design on the top which was fine but I thought the girls would like them even more if they got to customize them. Really we just have a huge collection of stickers that I never am sure what to do with and this seemed like a good way to use some of them. So I gave each of them a tin, put out all the stickers we have hanging around on the table and let them go to town. The Bean randomly stuck a bunch on but the Bee was very precise about her arrangement. 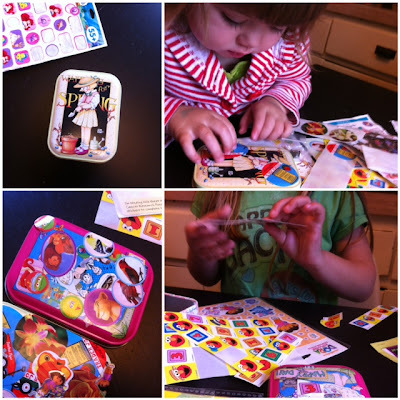 To help the stickers stay on I gave each tin a good coat of Modge Podge. Once the tins had dried, I tried to figure out what to put in them, that the girls would like and want to play with on the plane. 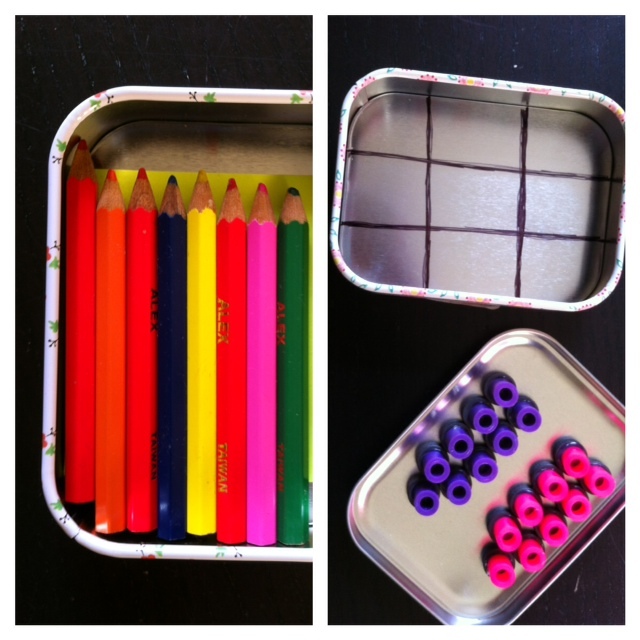 Since the Bean is really into coloring I found some small colored pencils we had that fit perfectly into the tin. Then stuck in a 3x3 pad of post-its which also perfectly fit in. For the Bee I decided to make a fun tic-tac-toe game, one of her favorites. I found some small magnets we had, I think I got them at the craft store a while ago. I then used a hot glue gun to glue pink and purple plastic beads to the magnets. Although you could use anything, I choose the beads because we have a bunch and pink and purple are the Bee's favorite colors. I made nine of each color which is more then enough. 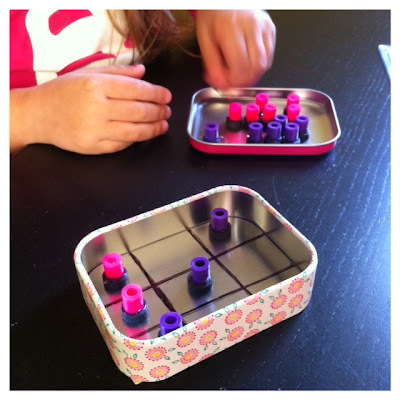 I then got out a sharpie and drew some lines dividing the tin into 9 squares for the tic-tac-toe board. The Bee and I spent a long time this morning testing out the game and it works great! These little tins are just the right size for the plane or even just for keeping in your bag when you need something to keep little ones busy. I will let you know how they worked out when we get back!